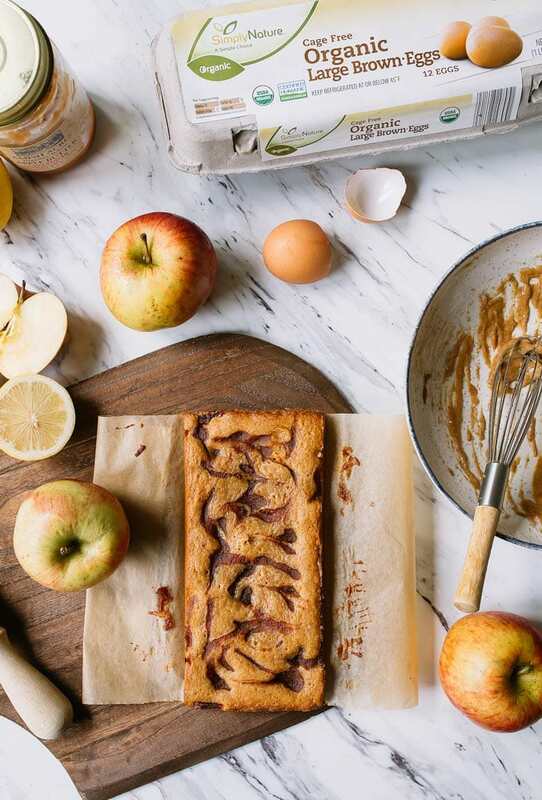 One Bowl Apple Butter Cake Recipe: I partnered with ALDI to bring you this delicious apple butter cake. Read on for my thoughts visiting their store since their big remodel! A snack cake is something that you can easily make (usually doesn’t require frosting, or if it does, the recipe is super simple), and is perfectly acceptable to eat any time of day—breakfast, snack, or dessert. Snack cakes are quick to make and often only require one bowl. A snack cake is to regular cake like leggings are to jeans—both are perfectly acceptable pants, but one is more comfy than the other. One is decidedly less fussy and more inviting. Do the snack cake. Do the leggings. Love yourself already. I partnered with ALDI for this recipe, and they asked if I would visit one of their newly remodeled stores and share my thoughts on it. Since I am a grocery store aficionado, I quickly said yes. And you guys—the ALDI store blew me away. I was absolutely floored by the number of organic products, and the array of healthy items that can be much pricier at other stores (flax seeds, chia seeds, almonds quinoa, just to name a few). And the new store lay-out is beautiful and just made sense to me. My shopping trip was quick and efficient (except for the multiple times I got drawn in by all the good deals, hah)! ALDI is my new go-to store! I quickly walked to the baking aisle first (it’s my barometer for grocery stores, of course), and I stocked up on everything…and I mean absolutely everything! Flour, sugars, vanilla, chocolate chips, condensed milk, spices and apple butter (a HUGE jar!). My baking pantry was low before this trip, but now?—it’s overflowing. But that’s fine because the baking season is here, hooray! 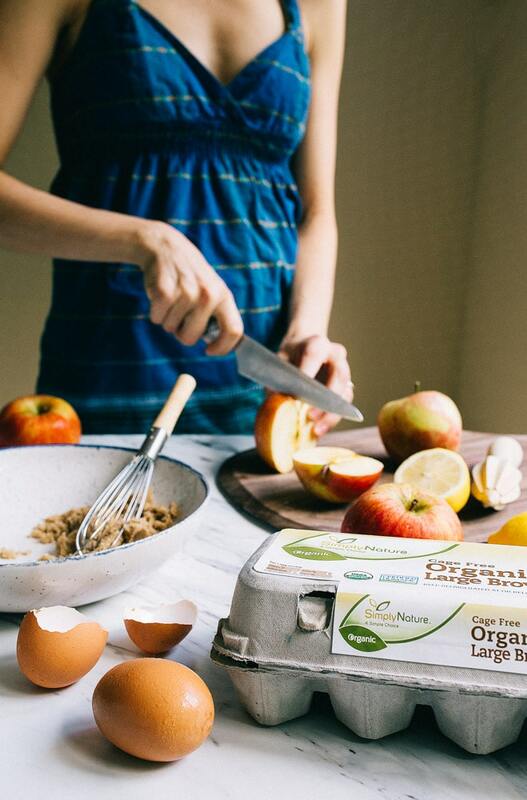 I stumbled upon SimpleNature Organic Cage Free Brown Eggs in the cold case (a 2017 Best New Product Award winner*) and grabbed a few cartons so we could really get this baking show on the road. I was so happy to find organic cage-free eggs at such a great price! I won’t confess to how many dozen eggs I bought…(5, okay, FIVE dozen eggs. I mean, I do go through a lot of eggs scaling down recipes over here). At the time, I didn’t quite know that I would be baking you a one bowl apple butter cake recipe with those eggs, but I’m super happy with the way this one turned out. It uses just an egg yolk, but as you know—you can head over to check out all of my recipes that use an egg white anytime you have a leftover egg white. And I also have a section for leftover egg yolks, just in case. Ok, we’ve talked a lot but haven’t talked about this cake. 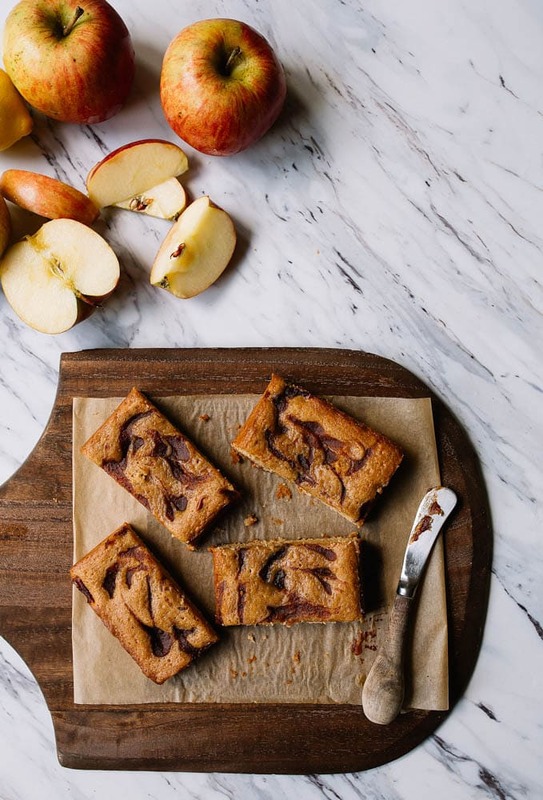 It’s soft, apple-y, and full of fall spices. 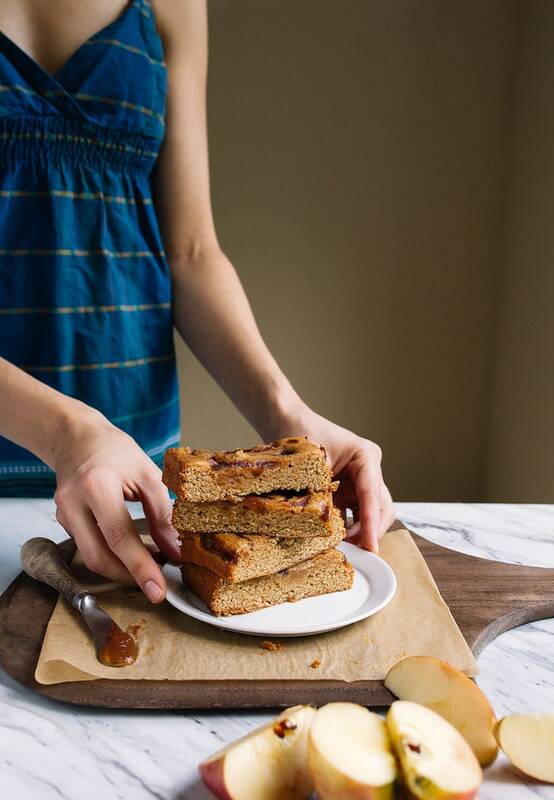 The only thing better than a bite of this soft spice cake is any bite you get with the apple butter swirl. The jam thickens a bit in the oven and gets even jammier and richer. I’m calling it: this is the cake to make for Fall! This cake is baked in a 9” bread loaf pan to get 4 small slices of cake. Enjoy! Line a 9” bread loaf pan with parchment paper. In a small bowl, whisk together the melted butter, brown sugar, 2 tablespoons of the apple butter, egg yolk and vanilla extract. Whisk very well to blend. Sprinkle the flour, cinnamon, salt, and baking powder evenly over the surface,and stir to combine. Spread the batter in the loaf pan, and dollop the remaining tablespoon of apple butter over the surface gently. Use a knife to swirl in the apple butter. Bake for 19-21 minutes, or until a toothpick inserted comes out clean. Let cool in the pan for 15 minutes, run a knife along the edge of the pan, and remove the cake. Slice into 4 even pieces and serve. The names of the ingredient in this recipe refer to the exact names you’ll find at ALDI. 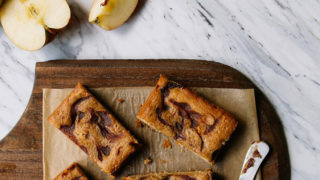 *You can use homemade apple butter. This looks really good and easy to make GF and vegan. I absolutely love my Aldi store. I’ve been shopping there regularly since 2011 and have loved seeing the transition to more organic and high-quality foods. It amazed me at first to see how much money I saved every week! I was just looking for a recipe to use your awesome small batch apple butter in and this perfect! Thanks so much for all the hard work you do to share these recipes with us. Also, snack cakes are the best. I still really enjoy the Brazilian version of carrot cake because it’s simple & easy to make in a blender. I think I forgot to pass that recipe along to you before. I just made this as mini muffins using Trader Joe’s pumpkin butter, regular granulated sugar and pumpkin pie spice. I was nervous because the batter was super thick but they came out great. This batch made 14 minies and baked for 20 minutes. Keeper recipe! thank you for this recipe and for “2-sizing” it since I don’t want to much of this around (in a good way!) love all of these flavors, I’ve only found them in bars before this recipe, not cakes! I’m a huge ALDI fan! I do almost all of my grocery shopping there..I basically only go somewhere else if they don’t sell it at ALDI. One tip though – skip the cocoa powder. It’s a little lacking in chocolate flavor compared to other cocoa powders…but I’m also super picky about that. Your timing could not be more perfect. I went apple picking this weekend and turned half of them into apple butter yesterday. To be honest, I had no idea what I was going to do with all of it but I’m now so excited to use some up to try this cake! Gosto de tudo que leva maçã, sou apaixonada por essa fruta, esse bolo com certeza será uns dos meus preferidos, não vejo a hora de preparar, deve ser uma delícia. I can’t get enough of Aldi either. It took me 3 years after I heard about it to start shopping there and I don’t know why. I always imagine the money I could have saved in those 3 years. They have fantastic products and great produce! I recently made apple butter and this sounds like another great way to use it. Thanks! It’s so beautiful! I vote to make it with your homemade Apple butter. Fresh is best, right? Love that ALDI offers so many great products! I saw this recipe earlier today and had to give it a go! I made them as mini muffins, baked for 18 minutes, and it made 15 of them, yay! I cut back the sugar by 1tbs because we’re watching calories, and by my math they’re about 58 calories per mini muffin, which is comparable (or better) than many little single snacks. This is a great recipe and I’ll DEFINITELY be making them again and again! Thanks so much for this recipe! YAY! So glad to know they can be adapted! I’m not really sure what happened but this cake was very flat for me, it was delicious though! Maybe more baking powder was needed? It rose, just not much. I might try doubling the recipe, even for just me and my son, it was a little small! We only got our Aldi store earlier this year and when we finally decided to try it, I was amazed!! I still am. We do have chickens, elderly girls but still giving us plenty of nice organic eggs for two, so I’ve only tried the eggs once..and loved them!! It looks amazing and I have everything I will need right in my pantry. I will be using my own home canned apple butter, but failing that, in the future I’d have no problem using AB from Aldi’s!! My husband made homemade Apple butter using a crock pot. It will be interesting to see how this recipe for cake in a loaf pan will come out. Be blessed all the bakers out there. I haven’t tested this recipe with anything but a real egg. Have you ever used a flax egg?